Hope you all got that Eve reference. 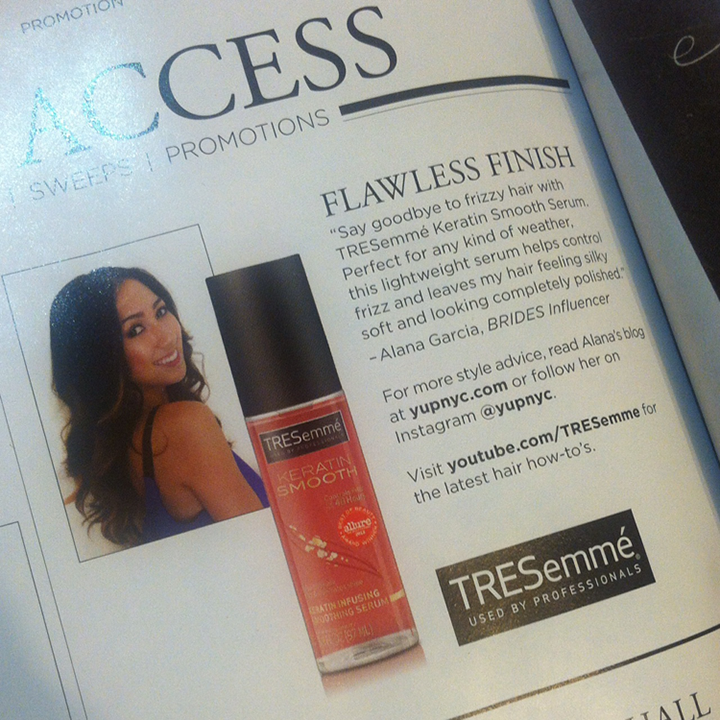 As part of the BRIDES Influencer network, I was selected to be featured within the magazine's 80th anniversary issue to share one of my favorite products, TRESemme's Kertain Smooth Serum. Coming from a girl who has wavy, thick, and unruly hair, this serum tames frizz and leaves you feeling perfectly polished. If you're passionate about the bridal world or you're an aspiring blogger who needs meaningful content to post, I highly recommend joining the BRIDES Influencer network. Members of the network will receive insider previews, special samples, and exclusive offers — and ever more surprises along the way. But please don't be mistaken. Just because I was featured in BRIDES (and worked there) doesn't mean I know anything about planning a wedding, what dress you should wear, or anything bridal related — according to my friends I'm suddenly an expert. So please leave your questions to the real experts and tweet to @bridesallaccess. Fun fact: my headshot was taken by my roommate with my Canon point-and-shoot camera in my living room. She did a pretty good job ey? Alana! Congrats again on this feature! I didn't know about this Brides network thing and may have to apply now! And did Mai take the photo for you?? #skillz hehehe See you soon in October hopefully!! Tina, you're comments always makes my day :) Thanks so much and hope to see you in Oct!! !